Be at home with us at Novotel Saigon Centre. 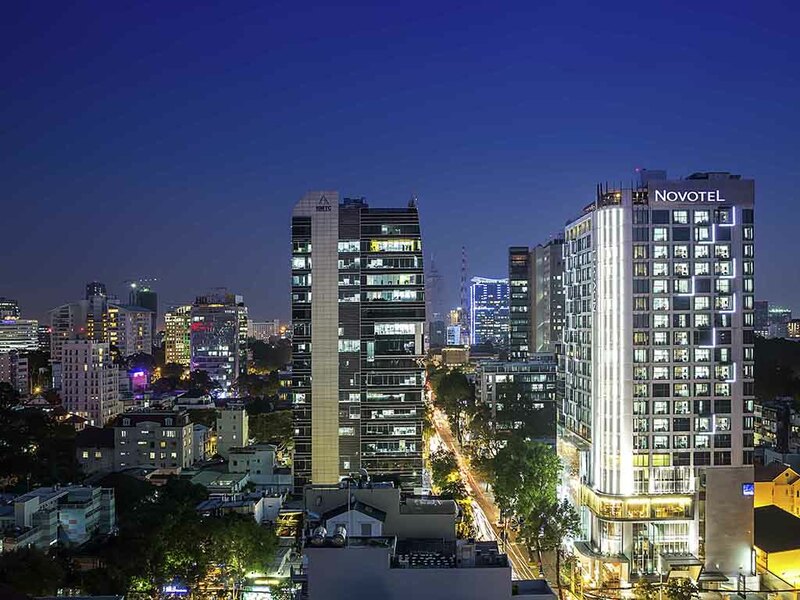 The 4-star Novotel Saigon Centre is located in the heart of Ho Chi Minh City with easy access to major consulates, commercial areas, and shopping centers. The hotel, with its 247 comfortable rooms, offers stunning city views from every side and free WIFI. Novotel Saigon Centre also features a relaxing swimming pool and an elegant spa. It is easy to reach of attractions in Ho Chi Minh City from Novotel Saigon Centre: Airport is 6km away, Saigon Square center, War Remnant Museum, Notre Dame Cathedral is within walking distance; Bitexco and Ben Thanh Market just a short drive away. Located in downtown Ho Chi Minh City with offices, major consulates, shopping and entertainment facilities, the hotel is also walking distance to the city's main attractions, which include Ben Thanh Market, Notre Dame Cathedral and Opera House. Indulge yourself in a modern and comfortable room designed to meet all your needs. A premium bed and special touches that make the difference. Relax, get some work done and take full advantage of your stay after a busy day. Embrace freedom and calm, Deluxe room is cozy and more spacious area 31 m², with better view and more daylight. Facilities and benefits is the same as Superior Room. With a touch of fresh modern décor, not forget to save a lovely spot for Kid Corner, The Square offers cozy comfort for every customers. Its remarkable open kitchen concept features exquisite Asian and Western cuisine every day. Enjoy the cocktails and refreshments on offer at the swimming pool. With the stunning view by the pool and its leisure atmosphere, the bar is perfect for all social or business meetings. Perfectly located at hotel lobby, the bar offers coffee, cocktails and light snacks throughout the day. Surrounded by a modern atmosphere indoor or relaxing at outdoor terrace watching the city life passing by. OnTop Bar, a stylish rooftop bar located on the 20th floor, provides stunning views over the Saigon skyline from the outdoor terrace. Come and chill out with friends or business associates at a relaxed and casual yet hip ambiance. Located on 19th floor with stunning cityscape panorama, it is accessible only to Premier Floor guests. It features a private lounge with exclusive benefits such as express check-in, private meeting room and complimentary evening cocktail open bar. food could be improved at the restaurant. Service staff are great! Responding and room services are extremely satisfied. Foods, room services such as cleaning, providing stuff and receptions are up to the level we are expected. Also the room size and furnitures are more than the adequate. Staff is very friendly and supportive. All staff are willing to help,very good experience. the staffs are efficient and friendly. The room is clean and the buffet breakfast is awesome. Good varieties but it will be better if you cater for HALAL/KOSHER Food. Very friendly staff, which is a big plus! Staying at Novotel Saigon felt like staying home in Saigon. The staffs were all professional and gave exceptional service all throughout my stay - they can give you instructions well, you can ask them almost everything, and is willing to do extra mile in assisting customers. I did not experience any issue during my stay. Service was good and attentive. Product seemed over priced and did not represent good value, both for rooms and F&B. Conference facilities were good however. The executive lounge was very good, quiet, good for working, able to take private calls, and have refreshments. That was worth while. Also the service was good there. I am pleased to spend my working days with Novotel hotel, all of things is awesome and hope your hotel will keep and continue improving your services. The team at the all-day-dining restaurants were very friendly and welcoming. Love the fair trade in-room amenities and the room was fresh and comfortable... however no more plastic drinking bottles in-room please, especially when they are all so tiny bottles. I go through all of them every day in my room and seems like a lot of waste but nowhere else to get drinking water. Very happy with this trip stay. Comfortable, clean and good rest. I had a short visit in HCMC for meetings and staying at Novotel Saigon Centre was simply excellent choice. Location, professional and warm staff, room cleanliness, and everything. I arrived at 1.30 p.m. after international flight and my room was ready. I really recommend Novotel Saigon Centre for those who look for perfect place to stay in HCMC. Good. The room was nice, clean and modern. I feel welcome. Happy with the room, hotel location. Check in and out seemed slow. Room décor seemed slightly dated, too dark. Breakfast good, but quality varied. Most staff very good, not all. Happy hour on top floor very nice, best experience in Hotel.